Entrepreneurs are at the forefront of invention, and have pioneered technology and development in all areas of our lives, from aeroplanes to solar power, and now the solar powered plane! See how enterprising YOU can be! Its time for you to apply to be Enterprise Leader! This is a fun way to show how good your understanding is of what it means to be enterprising. Simply download the form shown below, fill it in and let your inner entrenpeneur shine through. Practice enterprise by setting up a pupil led Healthy Tuck Shop or Stationery Shop in your school. 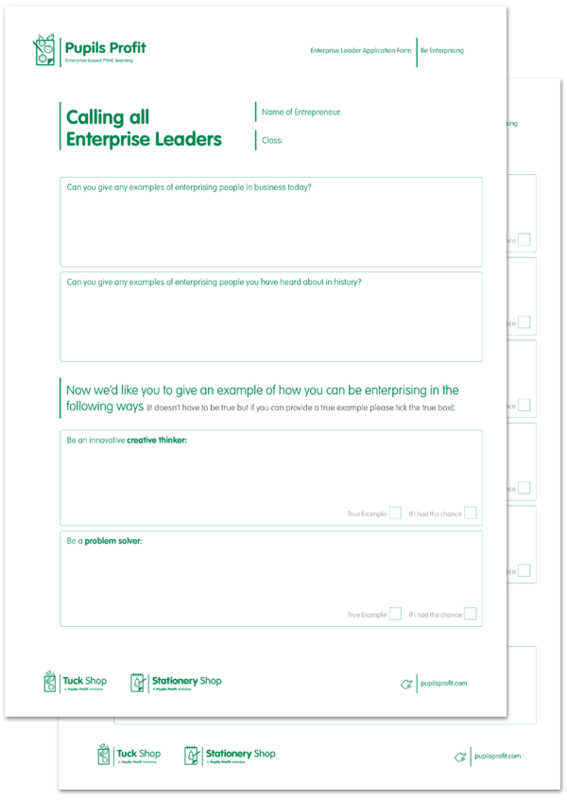 Use Pupils Profit â€˜Be Enterprising Resourcesâ€™ to allow your class to apply enterprising attributes to a series of changing business scenarios. Pupils will understand that risk is an integral part of enterprise, and by being alert and aware of their environment, risks can be reduced and opportunities uncovered. They will see the positive attributes of leadership and team work, and how positive messages are used in marketing. The scenarios introduce the concept of loan, debt and interest and pupils will understand how VAT is incorporated into selling and cost prices. Please advise us of how many classes require the resources and weâ€™ll provide you with a price. Email us here. Advert/Advertisement: A feature about a product or service that a company would like to sell, eg in magazines, on TV, website. Generally these are paid for by the company selling the product or service. Competitors: Companies selling similar products or services. Customers: Someone buying goods or services. Entrepreneur: A person who sets up a business, despite financial risks, because they judge there is good potential to make a profit. Enterprise: Enterprise can mean a business. Someone â€˜with enterpriseâ€™ has eagerness to do something new and clever, despite the risks. Enterprising: An enterprising person sees opportunities where others do not. They might come across a pile of scrap metal and see the making of a wonderful sculpture. They might drive through a run down part of town and see a new housing development. To be enterprising is to keep your eyes open and your mind active. It's to be skilled enough, confident enough, creative enough and disciplined enough to seize opportunities that present themselves. Essential/Luxury: Essential items are things you need to live, such as simple food, water and clothing and a home. Luxury items are things you donâ€™t need, but you may still want them! Interest: Money charged to you by a bank or financial organisation lending you money. Or money paid to you by a bank or financial organisation where you keep your money. The bank charge you if you borrow from them but they pay you if you keep your money there, they pay you more if you promise to keep it there for a longer time. Loan: An amount of money that is borrowed often from a bank, and has to be paid back. Usually youâ€™ll pay interest as a charge for borrowing. Eg you borrow Â£75 and youâ€™ll pay the bank back the Â£75 plus their interest, which could be anything from a 0%-100% or more â€“ make sure you understand all the information! Marketing: Includes advertising, promotions and all ways of trying to persuade customers to use your service or purchase your products. Press Release: A statement which tells the press everything that youâ€™d like them to write about. The press may choose whether to use the information to write an editorial article. Editorial articles are free or charge, whereas advertising is paid for. Profit: The cost of selling something minus the cost of buying it, is your profit. Promotion: In business this generally means a special offer, such as 20% off, or buy 2 get 3rd for free. Promotions run for a specific limited time period. Rent: A shopkeeper will pay rent to the property owner, so that they can use the shop. Revenue: The total amount of money received by a company, for goods or services bought by its customers. Risk: Where there is a chance or probability that something negative may happen. Salary: A regular payment paid to someone in return for them regularly doing a job. Selling Price: This is the price a customer buys something for. VAT: Value Added Tax. This is a tax paid to the government for the sale of many goods and services. Wholesale Price: The selling price for a product being sold in bigger (bulk) quantities to a shop. The shop then sells the products to the customer for more than the wholesale price they paid for them.